Getting links removed is a tedious business. It’s just as tedious for the site owner who must remove the links. Google’s annoying practice of "suggesting" webmasters jump through hoops in order to physically remove links that the webmaster suspects are bad, rather than Google simply ignoring the links that they’ve internally flagged, is causing frustration. Is it a punitive punishment? If so, it’s doing nothing to endear Google to webmasters. Is it a smokescreen? i.e. they don't know which links are bad, but by having webmasters declare them, this helps Google build up a more comprehensive database? Bit of both? It might also be adding costs to SEO in order to put SEO out of reach of small companies. Perhaps it’s a red herring to make people think links are more important than they actually are. I received an interesting email the other day from a company we linked to from one of our websites. In short, the email was a request to remove links from our site to their site. We linked to this company on our own accord, with no prior solicitation, because we felt it would be useful to our site visitors, which is generally why people link to things on the Internet. Webmasters who receive the notification are encouraged by Google to clean up their backlinks, because if they don’t, then their rankings suffer. But, essentially from our point of view when it comes to unnatural links to your website we want to see that you’ve taken significant steps to actually remove it from the web but if there are some links that you can’t remove yourself or there are some that require payment to be removed then having those in the disavow file is fine as well. So, of course webmasters who have received a notification from Google are going to contact websites to get links removed. Google have stated they want to see that the webmaster has gone to considerable effort to remove them, rather than simply use the disavow tool. The inevitable result is that a webmaster who links to anyone who has received a bad links notification may receive the latest form of email spam known as the “please remove my link” email. For some webmasters, this email has become more common that the “someone has left you millions in a Nigerian bank account” gambit, and is just as persistent and annoying. 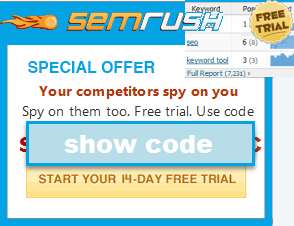 Webmasters could justifiably add the phrase “please remove my link” and the word "disavow" to their spam filters. Let’s assume this webmaster isn’t a bad neighbourhood and is simply caught in the cross-fire. The SEO assumes, perhaps incorrectly, the link is bad and requests a take-down. From the webmasters perspective, they incur a time cost dealing with the link removal requests. A lone request might take a few minutes to physically remove - but hang on a minute - how does the webmaster know this request is coming from the site owner and not from some dishonest competitor? Ownership takes time to verify. And why would the webmaster want to take down this link, anyway? Presumably, they put it up because they deemed it useful to their audience. Or, perhaps some bot put the link there - perhaps as a forum or blog comment link - against the webmasters wishes - and now, to add insult to injury, the SEO wants the webmaster to spend his time taking it down! Even so, this might be okay if it’s only one link. It doesn't take long to remove. But, for webmasters who own large sites, it quickly becomes a chore. For large sites with thousands of outbound links built up over years, removal requests can pile up. That’s when the spam filter kicks in. How does the webmaster know the SEO won’t do that anyway? Isn’t that exactly what some SEO conference speakers have been telling other SEOs to do regardless of whether the webmaster takes the link down or not? higherpurpose, nowhere in the original article did it say that Google said the link was bad. This was a request from a random site (we don't know which one, since the post dropped that detail), and the op can certainly ignore the link removal request. We’ve reviewed the links to your site and we still believe that some of them are outside our quality guidelines. Please correct or remove all inorganic links, not limited to the samples provided above. This may involve contacting webmasters of the sites with the inorganic links on them. And they make errors when they specify those links. They've flagged DMOZ & other similar links: "Every time I investigate these “unnatural link” claims, I find a comment by a longtime member of MetaFilter in good standing trying to help someone out, usually trying to identify something on Ask MetaFilter." Then the webmaster starts thinking. "Hmmm...maybe linking out will hurt me! 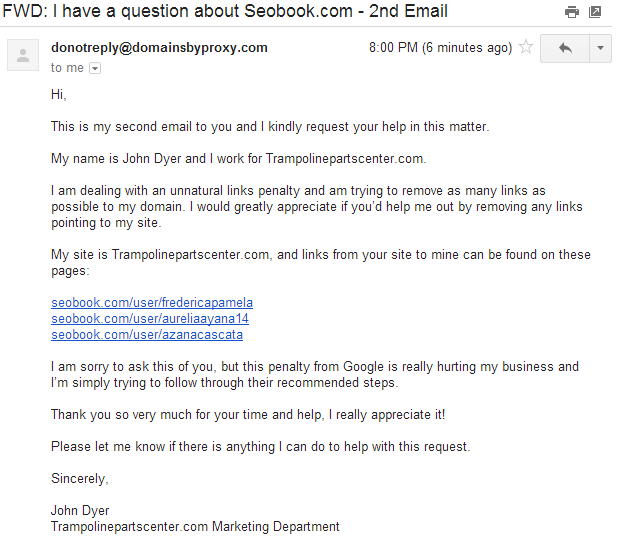 Google might penalize me or, even worse, I’ll get flooded with more and more “please remove my link” spam in future." The webmaster becomes very wary about linking out. David Naylor mentioned an increasing number of sites adopting a "no linking" policy. Perhaps the webmaster no-follows everything as a precaution. Far from being the life-giving veins of the web, links are seen as potentially malignant. If all outbound links are made no-follow, perhaps the chance of being banned and flooded with “please remove my link”spam is reduced. Then again, even nofollowed links are getting removal requests. As more webmasters start to see links as problematic, fewer legitimate sites receive links. Meanwhile, the blackhat, who sees their sites occasionally getting burned as a cost of doing business, will likely see their site rise as they’ll be the sites getting all the links, served up from their curated link networks. The Google webspam team seems to prefer psychology over technology to solve the problem, especially recently. Nearly everything that's come out of Matt Cutt's mouth in the last 18 months or so has been a scare tactic. IMO all this does is further encourage the development of "churn and burn" websites from blackhats who have being penalized in their business plan. So why should I risk all the time and effort it takes to generate quality web content when it could all come crashing down because an imperfect and overzealous algorithm thinks it's spam? Or worse, some intern or non-google employee doing a manual review wrongly decides the site violates webmaster guidelines? And what’s the point of providing great content when some competitor can just take you out with a dedicated negative SEO campaign, or if Google hits you with a false positive? If most of your traffic comes from Google, then the risk of the web publishing model increases. Is Google broken? Or is your site broken? That’s the question any webmaster asks when she sees her Google click-throughs drop dramatically. It’s a question that Matt Haughey, founder of legendary Internet forum MetaFilter, has been asking himself for the last year and a half, as declining ad revenues have forced the long-running site to lay off several of its staff. Then again, Google may just not want what MetaFilter has to offer anymore. Could this be uncompetitive practice from Google? Are the sites getting hit with penalties predominantly commercial sites? It would be interesting to see how many of them are non-commercial. If so, is it a way to encourage commercial sites to use Adwords as it becomes harder and harder to get a link by organic means? If all it did was raise the cost of doing SEO, it would still be doing its job. I have no idea, but you could see why people might ask that question. Let’s say it’s benevolent and Google is simply working towards better results. The unintended consequence is that webmasters will think twice about linking out. And if that happens, then their linking behaviour will start to become more exclusive. When links become harder to get and become more problematic, then PPC and social-media is going to look that much more attractive. Get an Android 4.4 device and you'll see what Google's vision of the future is: "Google Now." It's more of a large collection of parlor tricks than anything else (there's not much genius in showing a link to your hotel when it sees you are on hotel Wi-Fi) but if you have gmail attached passive information gathering for travel is on the right side of the "uncanny valley". If Google can figure out your e-commerce story, perhaps add some Mint-like functionality, it would be in a chance to pre-empt many searches and even introduce revenue-generating alternatives to users. It seems innocent now, but having little boxes pop up about your flight schedule or that you have a credit card payment due tomorrow insinuates Google between businesses and their customers in all kinds of little ways. What's depressing though is that Android is in so many ways a step back. Discoverability in the Play store is atrocious, both from the viewpoint of somebody looking for apps (who sees what looks like a "vast wasteland") and for the app developer that wants to "get discovered". ...so long as Google has more layers of control, it is better for the user. I sort of came to that same conclusion as well about the goal of displacing (as much of) the web (as possible) outright. The bad part is that game isn't just the game they are playing. Apple & Microsoft are playing the same types of cards. And Amazon looks to be headed in the same direction, along with Facebook. Almost everything online is rapidly shifting from open to closed. And as flow of traffic is diverted, flow of revenues dry up, which in turn further increase the barriers to entry for anyone who isn't riding on one of the closed platforms. I contacted a site to remove a link and he said he'd remove it if I paid $100. What the heck! ...that people do not want to pay, but in many cases the people doing removal requests wasted the webmaster's resources in the past by dumping on them & spamming their sites too, so why should those webmasters be obliged to work for free for others that spam them, particularly as many of those sites owner's threaten them & file their site in a disavow file (even if they remove the links)? Granted there is a range of situations. I've seen some "premium" directories which had their "premium" removal service advertised sitewide right near their "premium" listing features. And I think that can be somewhat absurd.